In the wake of Amazon and Barnes & Noble, a new wave of brick-and-mortar bookstores is rising to meet the high demand for printed books. Around the world in small towns and big cities, readers still prefer printed books over electronic versions. From small independent shops like Dallas’ recently opened Interabang to 30,000+ square-foot Bookstop, a smaller version of Barnes & Noble, the atmosphere to engage with books and buddies continues to draw people away from their electronic devices and into a world of printed books. Interabang Books opened this summer to bring #LiteraryDallas closer to living up to its newly coined name. Likened to BookPeople in Austin and Houston’s Brazos Bookstore, Interabang Books is a 5,000-square-foot discovery experience. 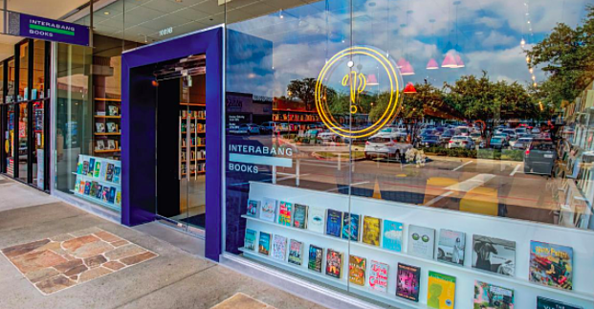 Although located across from a Barnes & Noble, Interabang is more comparable to newer independent Dallas stores like the Wild Detectives and Deep Vellum, which are flourishing in trendier neighborhoods where book lovers meet kindred spirits. Owned by Nancy Perot, daughter of Ross Perot, the bookstore itself reflects the community in the store, comprised of people with disposable income on a corner with a “certain bookselling mojo,” according to general manager Jeremy Ellis. At Interabang Books, the community is friendly and personable, which sets the new store apart from the traditional bookstore experience. In New York City, a similar trend is surfacing where bookstores no longer desire to replicate online giants like Amazon and Barnes & Noble. Rather, smaller, community-oriented bookstores are evolving to appeal to a newer generation. One example is the Greenlight Bookstore in Brooklyn’s Prospect Lefferts Gardens neighborhood and its sister store in Fort Greene. Owned and operated by Jessica Stockton Bagnulo and Rebecca Fitting, Greenlight and other indie bookstores succeed by forging strong ties within the surrounding community. Not seeing Amazon’s entry into the brick-and-mortar bookstore business as competition, Stockton Bagnulo explains to NPR how smaller independent stores like hers are a completely different business. Fitting adds that shopping in their own community helps people to feel more connected, improves the community’s tax base, and makes the community at large more interesting. One way that independent bookstores are able to build relationships within the store and community is by organizing events like book readings, author signings and conversations, and other activities. For example, Greenlight Bookstore recently arranged a reading and conversation with Mexican writer Yuri Herrera. In addition to holding events like these, Interabang Books expects to appeal to its customers by stocking its shelves with more than 19,000 books and adorning its walls with decorative art to create a warm, engaging environment. Check out its calendar of events which is already packed with author meet and greets, book discussions, and readings.